I have created a series of affirmations to share with you. Thank you for taking the time to read them. With the innate guidance of a pure heart……. I hope that you choose to say and more importantly feel any one or all of them until one day, you awaken to a constant free and joyful life. As the very moment any thought is actually conceived in your heart, tis then the moment your fondest prayer, a wish come true, will be. Pass it on. 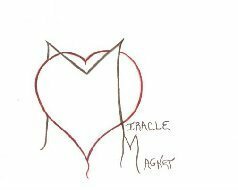 And may we all be known… ” MIRACLE MAGNETS”! !